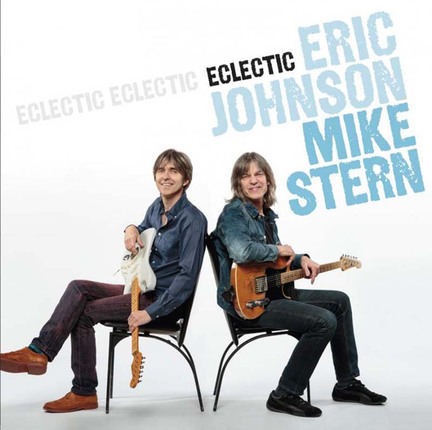 With Eclectic, Mike Stern and Eric Johnson, two guitar giants famed for their prodigious, often fiery technique, deliver a duet album that exhibits such a strong musical accord you might wonder why the two hadn’t recorded an album together before. The collaboration dates back to 2009, when Johnson guested on Stern’s disc Big Neighborhood. That led to a series of live gigs which, in turn, led to Eclectic. Johnson and Stern came to the album from different corners of the music world. Texas-born Johnson is well known among rock fans, particularly for his 1990 hit “Cliffs of Dover,” while Stern, an alumnus of bands led by Miles Davis, Billy Cobham and the Brecker Brothers, is thoroughly steeped in jazz and fusion. Both guitarists possess genre-encompassing styles, though, and they found plenty of common ground. Both guitarists share an appreciation for Jimi Hendrix, and they include a cover of his bluesy “Red House” on Eclectic; Stern makes his singing debut on the album, and he displays a solid, bluesy voice as he and Johnson share vocal leads on the song. Eclectic is a dazzling outing from two formidable, well-matched guitar heroes.